He was described by The New York Times as “one of Huntington’s most famous characters and dearly beloved friends.” He was “known to every man, woman and child living within a radius of several miles.” His death in 1906 was mourned by many and plans were soon underway to memorialize him. His name was Tom. He was a swan. The story of Tom the Swan is one of those interesting tidbits of local history that are often forgotten after the last person with a memory of it passes away. But Tom was so well loved that post cards bearing his image were printed; and these photographic memorials can still be found. The descendant of one of Tom’s “owners” also remembers being told about Tom and was curious about his current whereabouts, but more on that later. Tom was originally owned by P.T. Barnum, who had imported a pair of swans presumably for his Happy Family circus exhibit. The exhibit of various animals living in harmony in the same cage was supposed to inspire humans to live in peace with their fellow man. Apparently, the animals’ complacency was drug induced. This Civil War-era exhibit may have been the inspiration for Animal Crackers, which are still sold at circuses. According to one account, Tom did not follow the script for the Happy Family exhibit. He became agitated and attacked and killed other animals in the cage. According to another account, one of the pair of swans imported by Barnum soon died and the survivor was given to Dr. John Rhinelander, who had retired to Huntington in the 1830s (his house still stands on Kane Lane in Huntington Bay). In the second account, there were in fact two pairs of swans. One of each pair dying shortly after being imported and each of the survivors given to Dr. Rhinelander. Dr. Rhinelander died before 1864. 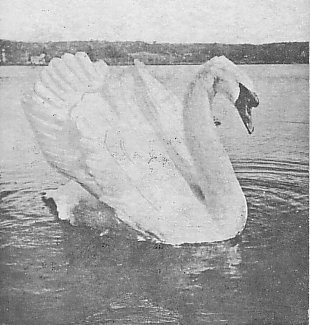 If Tom were indeed one of the swans given to Dr. Rhinelander by P.T. Barnum, he would have been at least 43 years old when he died (the story announcing his death conceded that his age was a mystery, but reports that “good authorities state that he was probably between 75 and 100 years of age”). Swans typically live no more than 20 years, so it is more likely that Tom was the offspring of the pair given to Dr. Rhinelander. In any event, Tom was well known around Huntington. He—or his parents—decided that the waters of Huntington Harbor were more inviting than the fresh water ponds on Dr. Rhinelander’s estate. He and a mate soon built a nest in Thurston’s Cove, the area we now know as Wincoma. In light of the swans’ preference for that location, Dr. Rhinelander gave the swans to Lewis M. Thurston. It should be noted that a third account credits Thurston with introducing the swans to Huntington’s waters. The swans reportedly hatched four to six cygnets each spring, which were sold by Thurston’s sons for as much as $60. But once the nest was discovered local boys would steal the eggs and the flock dwindled to just the pair. Tom may have had as many as three mates. One was reportedly killed on her nest by a dog; another was shot by a group on a steamboat and the third abandoned poor Tom. By the time Thurston died in 1895, just shy of his 91st birthday, the swans had not been seen since the year before. It was assumed they had been shot. But on that day in October 1895, the pair returned to the harbor and resumed their residency in Thurston’s Cove. Tom’s mate—presumably his third—disappeared soon thereafter. When Thurston’s property was auctioned off, Tom was purchased by Gustav deKay Townsend. Although Tom was allowed to remain free, it was thought if he had an owner, his life would not be in danger. In his old age, Tom did not appreciate the advent of motor boats. He would fly straight at them flapping his large wings in an attempt to scare them off. Tom wandered the waters of Long Island alone. He spent the winter of 1899-1900 in Northport and had been seen as far east as Port Jefferson. By November 1900, he was back in Huntington Harbor where Warren S. Sammis and Silas Ott made sure to feed him during the cold winter months. Tom was found dead on the shore of the millpond in February 1906. The original report did not indicate the cause of death. Writing nine years later, The New York Times reported that he had been hit by a car. Whatever the cause of his death, it was immediately suggested that he should be stuffed and placed on display in the library at the Soldiers & Sailors Memorial Building. Mrs. John Caire was retained to do the work at a cost of $25. Contributions to defray the expense were accepted at local drug stores. Within a month $20 had been raised. Over the summer, the children of the village held a fair on the lawn of Charles N. White’s house on Carver Street. They raised $5.76. Two weeks before Christmas, Tom had been stuffed and was on display in a glass case in the library. Since he stood fully four feet high when out of the water, the library soon found that he took up too much room. In July 1914, the library gave Tom to the Huntington Historical Society to display in the newly acquired Conklin House Museum. Even in death Tom remained a popular attraction. A lengthy New York Times article about visiting Huntington to see sites associated with Nathan Hale thought the trip to Huntington would not complete without a stop to see Tom. Recently, a descendant of Lewis Thurston wrote to find out whatever happened to Tom. He remembered his mother telling him about Tom and how he had been stuffed and put on display in the library, but that he had eventually found his way to the basement of either the library or the Conklin House. He is in neither place today. The Huntington Historical Society’s accession records do not include a listing for a stuffed swan. As popular and well loved as he was, over the years his story was forgotten and some time in the last several decades, it was decided that there was no room for a stuffed swan in the Historical Society’s collection. Today, Tom’s story lives on through the surviving post card images of a magnificent bird. The New York Times, August 22, 1915. The New York Times obituary for his wife in the March 16, 1864 refers to the late Dr. Rhinelander.